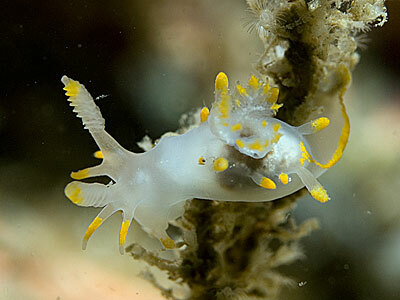 Description: The body of this nudibranch is translucent white. There are up to seven orange tipped processes on each side of the gills. 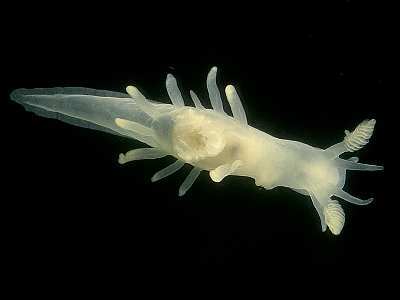 A pair of longer processes project forwards from the base of each rhinophore. 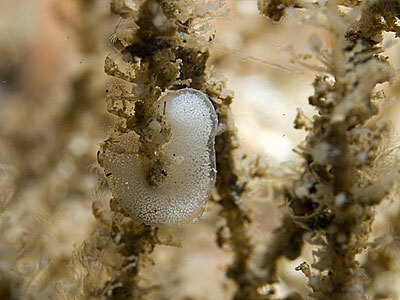 White ovotestis is visible through the transparent epidermis. The oral tentacles are short and tipped with orange. Orange pigment is also found on the tips of the rhinophores and on the tip of the tail. Occasional individuals can be found in which the orange pigment is replaced with white. Adult specimens may reach a length of 33mm. Habitat: The prey is reported to consist of compound ascidians such as Botrylloides leachi, Botryllus schlosseri and Diplosoma listerianum, but it is likely that this species actually feeds on minute kamptozoans such as Pedicellina cernua which are epizooic on bryozoa, hydroids and tunicates. Distribution: Ancula gibbosa is a widely distributed species found all round the British Isles but usually in small nunmbers. Similar Species: There are several other species with similar coloration including Polycera quadrilineata, Polycera faeroensis and Trapania maculata. Two anteriorly directed processes at the base of each rhinophore. Several processes at the sides of the gill cluster. Picton, B.E. & Morrow, C.C. (2016). Ancula gibbosa (Risso, 1818). [In] Encyclopedia of Marine Life of Britain and Ireland.